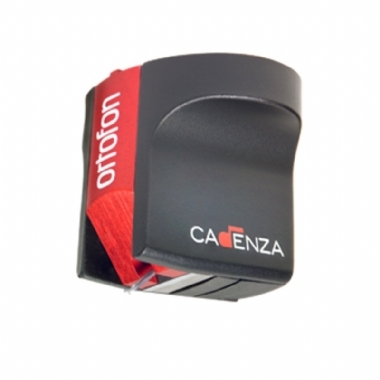 The Ortofon Cadenza Red is a gorgeous sounding cartridge, built to a level of sophistication and quality unique at this price. The Cadenza Red offers an engaging sense of timing, great rhythmic drive and excellent dynamic range. Built for long listening sessions, the Cadenza Red entices with its rich, warm tonal balance, enticingly deep soundstage and superb imaging. Built to incredibly high standards, the Red receives the Cadenza series body, a sandwich of stainless steel with an aluminum main structure in the center. This high-mass design eliminates vibration and resonance, improves tracking and provides an incredibly stable platform for the generating mechanism. Ultra-pure 6N silver coils are used for maximum resolution and outstanding dynamic shading; an improved winding process improves channel balance and imaging. The Fine-Line stylus rides lower in the grooves than other designs, allowing the Cadenza Red to retrieve previously obscured information.